This morning Amazon is officially launching its Android App Store — a storefront for apps that will compete directly with Google’s official Android Market. We first broke the news about the impending App Store back in September and had some thorough coverage on the details in January when it opened to developer submissions. But now the store is finally going live to consumers (it will be rolling out over the course of the day, so you may not be able to access yet). And while there were leaks abound about this morning’s launch, there are still a few details that Amazon managed to keep quiet. 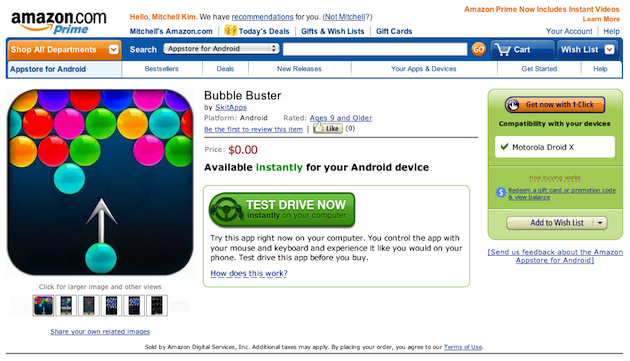 The biggest one: Amazon will let you ‘Test Drive’ nearly any Android application in the App Store directly from your browser using some very interesting technology (Update: Amazon says it’s available for “many applications”) . Click the ‘Test Drive’ button, and Amazon will launch an emulated instance of Android on its EC2 cloud, which you’ll be able to control directly from your browser (it uses Flash). Some features won’t work right now (like functions that take advantage of the phone’s accelerometer) but you should be able to at least get the gist of what you’re buying. Amazon was unable to give me early access to this prior to today’s launch, but I’ll update with my impressions as soon as I get to try it out. In other words, if your app gets picked for Amazon’s deal of the day, you’re entitled to 20% of the list price that you previously set. That may not sound like much, but these daily specials are probably going to see download counts that are far higher than normal. To coincide with the launch, Amazon is also announcing (as has been previously reported) that it has exclusive rights to the Rio version of Angry Birds, which is a tie-in to an upcoming feature film. 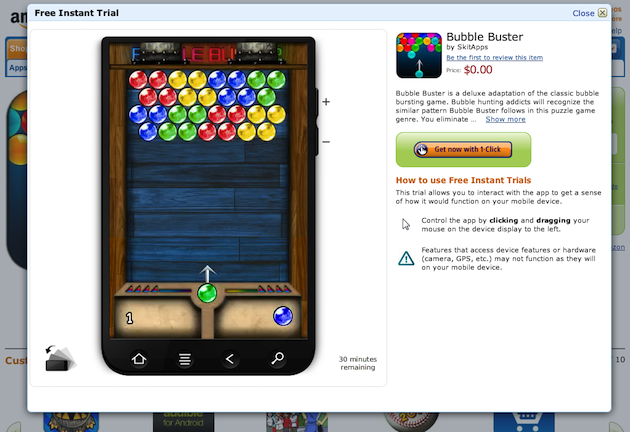 The game will normally sell for 99 cents, but will be available free for a limited time. This is a smart move on Amazon’s part, as it will give legions of Angry Birds fans a reason to check out the store in the first place (and will also likely prompt word-of-mouth exposure as friends show off their ‘special’ version of the game to each other). The App Store is a bold move on Amazon’s part because it’s going head-to-head with Google’s official Android Marketplace — and it may actually provide some serious competition. Unlike Android Market, which has a very open submission process, Amazon will be screening every application to ensure that it meets a certain standard of quality (it isn’t a high bar, but at least you’ll be assured the app won’t crash at launch). Amazon will also be undercutting Google’s marketplace on pricing. And it’s going to be recommending applications to users — even when you’re browsing physical goods on Amazon (if you’re checking out a baseball bat, it might recommend a baseball game for your phone). Of course, while you can access Amazon’s App Store from both its website and a mobile application, it isn’t coming pre-installed on most Android phones the way Market is, so it’s going to take a while to gain traction. But that will likely change. Expect Amazon to work out deals with carriers to come preloaded on phones. And my hunch is that the store will become very important for various splintered versions of Android that aren’t backed by Google, not the least of which could come from Facebook. 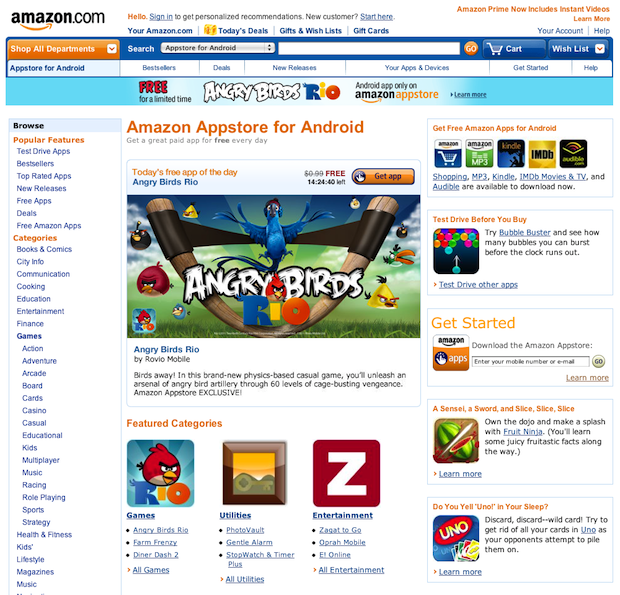 Oh, and just in time for the launch, Apple is suing Amazon over its use of the name ‘App Store’.